This healthy, hearty breed hails from England, where it was originally bred to drive cattle and guard farm property. The American bulldog still maintains those protective instincts; you can see that in the way this breed creates strong bonds with its owner and fearlessly defends him or her against anything perceived to be a threat. Though they may have a tough exterior, these dogs are also known for interacting well with children and other pets -- especially if you socialize them early on to foster their naturally happy, friendly temperaments. 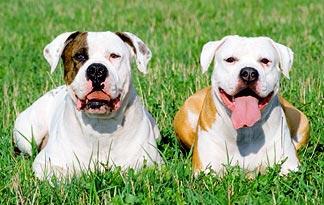 The American bulldog also has a very sturdy and muscular build, with a short, stiff coat that is relatively easy to groom and maintain.